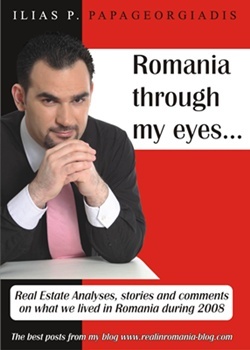 I recently read the book “Romania through my eyes…” after meeting its author Mr. Ilias P. Papageorgiadis who is the owner of one of the most active real estate agencies in Bucharest, More Real Estate Services. Reading this book is like seeing a movie with different cuts from different real life moments highlighting business related facts from the Romanian real estate market in 2008. After I started it I couldn’t let it go until it was finished because every chapter made me curious to see what’s next. Real estate adventures, hiring personnel, business environment, analyses, interviews are the main topics covered in the book. The style of writing is very modern is just like you sit at a table with Ilias and listening to his stories. gave me ideas and thoughts which weren’t in my mind before reading it. What I liked most was the part about hiring personeel which remainded me about how hard is to find reliable collaborators. I kindly recommend this book for every real estate professional as a “must read”. You can order the book here.